DENVER -- Colorado is less than a year away from the 2020 Census and much is at stake this time around. The census is a constitutionally-mandated headcount that happens once every 10 years for every person living in the United States. That data is then used to determine things like how much federal funding each state should get. It also gives states a better idea of what their demographics are and how they have changed over the years. “When we think about the number of people who have moved to Colorado, this is the best way to determine who that is, where they moved and even get some information about sort of why they moved in, what professions brought them here, etc.,” said Representative Kerry Tipper, D-Jefferson County. Colorado gets about one-third of its budget from federal funding. That money is used on everything from transportation to education to health care and more. “It determines a ton of federal funding. Three hundred programs that would affect Colorado are funded through census data,” said Rep. Yadira Caraveo, D-Adams County. In 2016 alone, about $13 billion in federal funding was given to Colorado based on 2010 Census data. 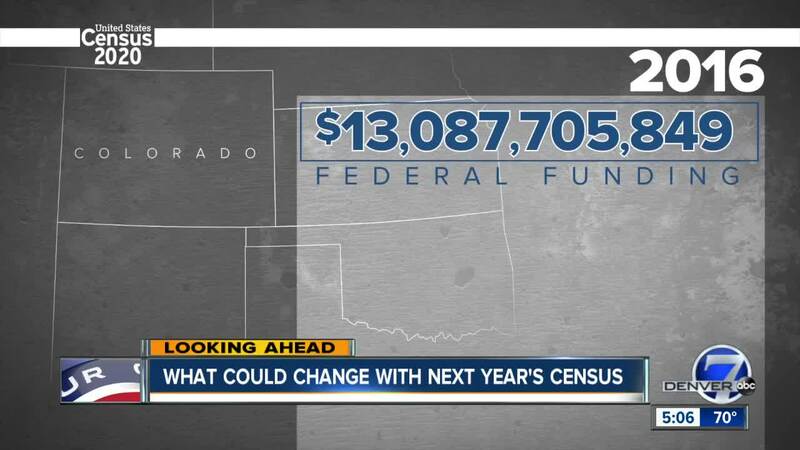 “The really important part of the Census isn't how the federal government is going to spend the money, it’s just where are they going to spend it? Are they going to spend it in Colorado or Iowa or California?” Rep. Tipper said. With a growing population, Colorado stands to gain even more federal funding this time around. The state has grown by roughly 600,000 people over the past decade, but the exact numbers won’t be determined until the head count happens. “This is really critical information that helps us (plan on) how we prepare for growth moving forward as well,” Rep. Tipper said. Beyond the money, Colorado also stands to gain at least one Congressional seat due to its population growth. However, that might not happen if there is an undercount. The 2020 Census has already become a controversial topic this time around, moreso than in years past. The Trump administration wants to add a question asking people whether or not they are a U.S. citizen. However, several federal judges have blocked the attempt — and Colorado has joined more than a dozen other states to make sure the citizenship question is omitted in the census. Even as the case makes its way through the court system, some are concerned about the consequences such a question could have. “It’s going to have a chilling effect, it already has honestly,” Rep. Caraveo said. The Colorado Health Institute (CHI), a non-partisan policy group, agrees that the question could cause fewer people to decide to fill out a Census form regardless of their citizenship status. Beyond that, research collected by CHI and others suggests a low level of trust in the federal government currently. “We think that could make some people hesitate to get all of this information to the federal government,” said Emily Johnson, the director of policy analysis for CHI. The third big reason an undercount could happen this time around is due to the fact that the census is going digital for the first time ever, which could pose a challenge for older generations or those without access to the internet. Additionally, several funding cuts to the census caused two out of the three planned test runs to be canceled this year, according to Johnson. Those test runs help determine how many enumerators need to be sent out into the community to go door-to-door to try to get a head count. An undercount could have big financial consequences on the state, since the federal money would be allocated elsewhere. “Even just a one person undercount in Colorado means that we lose $630 million over the course of 10 years,” Rep. Caraveo said, citing a George Washington University study. CHI predicts an undercount of about 4%, which is about 225,000 people or about twice the population of Boulder. “The reason we’re concerned about this as a health policy group is because it puts about $245 million in federal funds for health programs at risk over 10 years,” Johnson said. That money is used for Medicaid, substance abuse and prevention programs, clinics and other health programs. “For a lot of them, we think this could limit their access to insurance coverage, which would limit their access to preventive care, vaccinations, health screenings, etc. and could lead to poorer health outcomes for a lot of Coloradans,” Johnson said. The problem is that research suggests many of the low-income people and minorities who rely on this federal funding the most are less likely to participate in the census. As for the additional congressional seat, it’s still unknown whether Colorado will actually earn it. States are spending millions of dollars to create outreach programs to make the census count more accurate. California is spending more than $100 million on its count, according to Rep. Caraveo, while states like Georgia are contributing more than $2.5 million. “When we came back to see what Colorado was doing, we discovered that the (census) department had really only asked for $300,000 for mapping,” Rep. Caraveo said. In an effort to get a more accurate count, state lawmakers are now considering a bill that would create a census outreach grant program, which has bipartisan support. House Bill 1239 would create a seven-member committee to look at the policies and procedures Colorado uses to promote a census count and award money to groups, local governments and others focused on education and outreach. “It’s not political, it really affects everyone equally,” Rep. Tipper said. The bill is still making its way through various House committees. For Representatives Caraveo and Tipper, the $12 million is a small investment with the potential for big payout. “Someone referred to it as a stake in the ground once every 10 years; it’s our only opportunity,” Rep. Tipper said. The census is set to begin April 1, 2020.